A dense, helium-bearing mineral, FeO2He isostructural with NaCl, may occur near the Earth’s core-mantle boundary. Image credit: NASA/JPL, modified. While it has been known for a long time that Earth’s mantle contains primordial helium that dates back to the early days of our universe and is continuously degassed into the atmosphere through volcanic hotspots, the exact reservoir in which that helium is stored at depth has been enigmatic. A new study led by Jurong Zhang at Jilin University in China, published in the journal Physical Review Letters, suggests that the helium is bound in the dense iron peroxide mineral FeO2He. 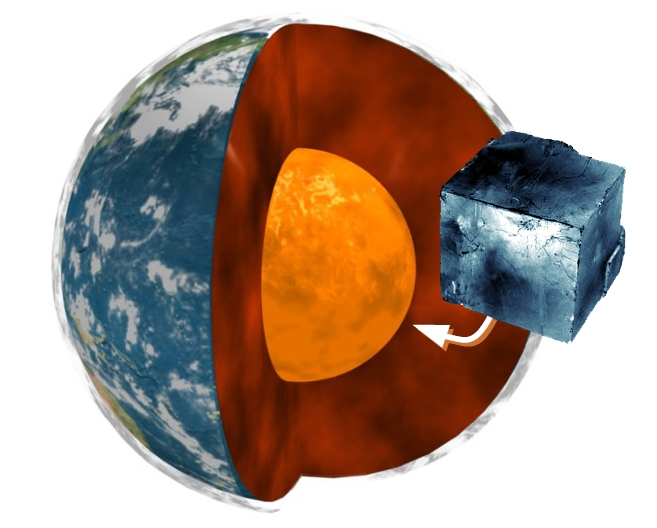 Under extreme temperature and pressure conditions in the lowermost mantle, close to the Earth’s core, the mineral would crystallize in a cubic crystal structure akin to that of table salt, sodium chloride. The calculated presence of FeO2He seems to be compatible with a zone of low seismic velocities near the core-mantle boundary.